Back in May of this year, I was disappointed that I would be missing Airbourne‘s lone Canadian tour date in Toronto since I was out of the country at the time. 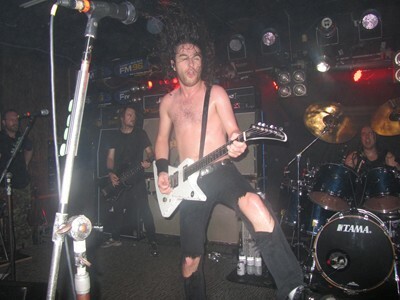 Having seen the Aussie rockers play in Kitchener, Ontario three years ago, I had no doubt that Airbourne would put on a great show. Luckily for me, Airbourne later announced a full scale tour of just about every decent size town or city in the province of Ontario during the month of August. I now had the luxury of choosing which show to attend with the caveat that I would have to do at least one hour of driving to get to any show. 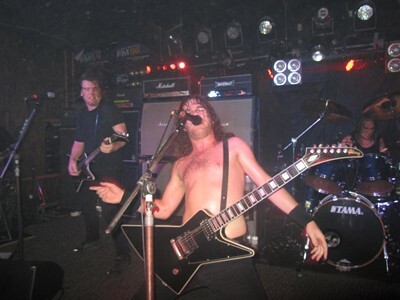 I ended up choosing to attend Airbourne‘s show in London, Ontario, given that it fit well with my schedule. The show was “only” two hours away on a Thursday night and I was intrigued to check out the venue Norma Jeans — which I guess would not hold more than 350 people. Unfortunately, this was the one Canadian date where Bleeker Ridge would not be opening for Airbourne. Given that the Norma Jeans staff member that I spoke to via telephone could not tell me when Airbourne would hit the stage, I played it safe and got to there by 9 pm. The stage was strategically well located in the venue with a large dance floor serving as the general admission section and what appeared to be a long bar-height table surrounding the dance floor to separate it from the tables and chairs in the other section of the venue. All of the concert goers appeared to be in this section, with almost no one venturing onto the dance floor. It became apparent that there was an opening band called Buffalo Brothers, which had yet to play, so I would likely have to wait two hours or so prior to Airbourne hitting the stage. Buffalo Brothers eventually hit the stage playing bluesy, classic rock influenced songs highlighted by some Jon Lord organ like sounds. The band did what it was supposed to do as the crowd started to gather onto the dance floor close to the stage. Given the crowd’s tendency to stay back until Airbourne finally arrived, I was able to get a great spot right next to the stage for their show — and there is nothing like hearing and enjoying a concert from a few centimeters away from star performer and frontman Joel O’Keeffe. During the break after Buffalo Brothers‘ set, and while the Airbourne crew was getting set up, I noticed that the headliner’s song list posted on the stage floor only had ten songs listed! I knew from past experience that Airbourne seemed to like to play a short set filled with excitement rather than a long one with some dull moments, but ten songs seemed kind of short for a headlining band. 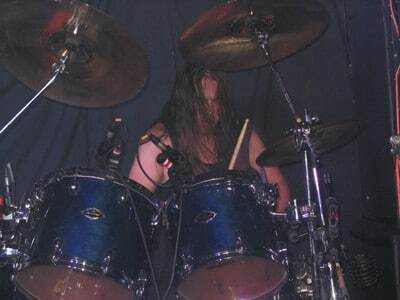 That turned out not to be the case because Airbourne ended up playing an extra song — “Blonde, Bad And Beautiful” — which was not on its posted song list on the stage floor. 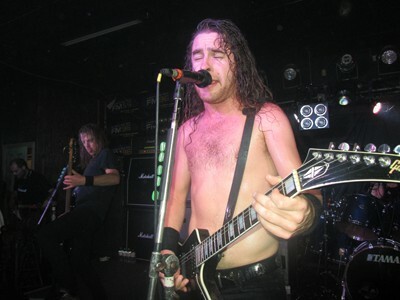 Airbourne stormed the stage with “Ready To Rock” from their latest CD ‘Black Dog Barking’. Right from the get go it seemed like everyone was well into the show and singing along. 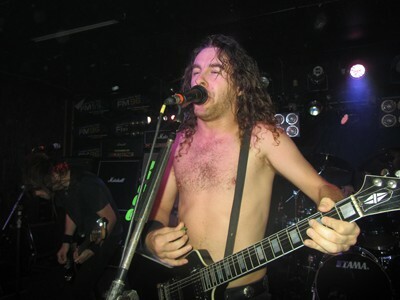 What makes Airbourne so special is that all of their songs are really good, usually in the same faster AC/DC mold, and the band exudes energy and excitement. Playing small sold out venues to rabid fans certainly helps keep the excitement level high. I assume that the Aussie’s show at Norma Jeans did sell out, given that the venue’s website was advertising that less than 20 tickets remained for the show a few hours prior. 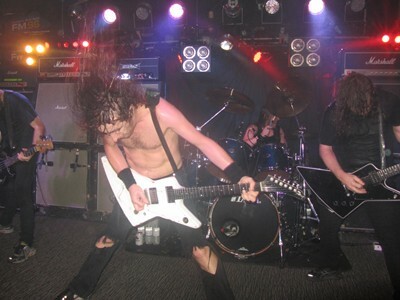 The Airbourne band members are pros at what they do — which is play beer-fueled hard rock at high energy levels. Every song seemed to be a highlight in itself and very well received by the crowd. I did not find myself wishing that a certain song was played as each one was a rocking tune. Each of Airbourne‘s three CD releases were well represented in their set with song highlights for me — and again, every song was very good — including “Chewin’ The Fat”, “Live It Up” and “Cheap Wine & Cheaper Women”. When frontman Joel O’Keeffe did address the crowd, he could be pretty funny in his Aussie laced English. For instance, he commented that Aussies and Canadians have a lot in common, ‘rock ‘n roll, drinking beer and Canadian weed…’ It was cool to see a roadie come by the stage, pick up O’Keeffe on his shoulders during “Raise The Flag” and carry him well into the audience for part of the song. The AC/DC comparisons just can’t stop since it reminded me of Brian Johnson carrying lead guitarist Angus Young on his shoulders. 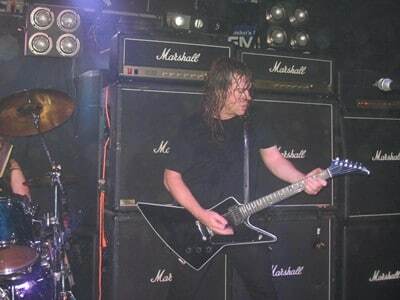 There is no question that Joel O’Keeffe was the star of the show, but the other band members did not seem to mind playing essentially the same — but important — role as Malcolm Young does in AC/DC. 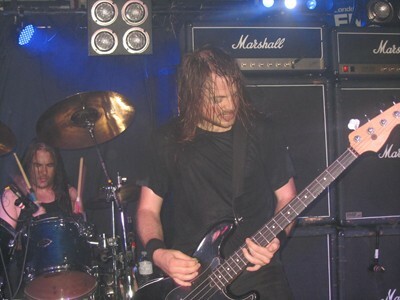 Airbourne eventually closed off their show with spirited versions of “Too Much, Too Young, Too Fast” and “Runnin’ Wild”. Although the band likely played only 75 minutes, I left the venue soaked in sweat, water and beer, and feeling that I had seen one of the best shows of the year. As an extra bonus, I got one of Joel O’Keeffe‘s guitar picks as a souvenir! The drive back to Toronto went without a hitch and I got home by 2:30 am — the following work day was more painful with a 6:15 am start.